Why is Hillary Clinton leaving out 'Rodham'? Many US newspapers have always referred to Hillary Clinton as Hillary Rodham Clinton - Rodham being her maiden name, and the family name she stuck with in the early years of her marriage. But now her campaign has told the Washington Post that she prefers to be just Hillary Clinton. Why? Hillary Clinton. Hillary Rodham Clinton. Mrs Bill Clinton. Hillary Rodham. HRC. Hillary. Talk about her name started when Hillary Rodham married former US president Bill Clinton in October 1975 and didn't take his name. She was still Hillary Rodham when her husband was elected governor of Arkansas in 1978, but at the next election in 1980 Republican Frank White seized upon this - and made a point of calling his wife Mrs Frank White. "It was controversial because it was a more conservative time, in a conservative state, and her image was far west compared to the average Arkansas resident," says Kyle Kondik, an analyst of political campaigns at the University of Virginia. Bill Clinton lost, and when he ran again two years later, Hillary Clinton said she would stop work and campaign full-time as Mrs Bill Clinton, according to Carl Bernstein, author of A Woman in Charge. But by the time Bill Clinton was sworn into office a few weeks later, Mrs Bill Clinton had become Hillary Rodham Clinton - the name she has mostly been known by over the three decades since. It was Hillary Rodham Clinton who ran for the Senate from New York in 2000. The first sign of change came when "Hillary Clinton" appeared on campaign signs and ballots in early primary states when she launched her 2008 White House bid. In 2007, Fox News suggested New York's junior senator was "having something of an identity crisis". "When it comes to running for president, she is 'Hillary Clinton,' according to her campaign website. But when it comes to her official Senate releases, she is still 'Hillary Rodham Clinton'," it said. But it was still Hillary Rodham Clinton who took office as secretary of state in President Obama's administration in 2009 - often abbreviated, it is now clear from her email correspondence, to HRC. Now Hillary Clinton's 2016 campaign website talks about "Hillary Clinton" and as often as not just "Hillary". There is barely a "Rodham" in sight. 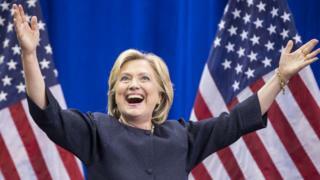 Clinton is "very careful to frame herself in a way that is most appealing to the political context of the time", says Dr Alison Dagnes, professor of political science at Shippensburg University. "Being the First Lady in 1992 is a very different position to wanting to be senator - when she was probably trying to define herself apart from her husband - which is a different position to wanting to be president." She points to Clinton's Twitter handle, which reads: Wife, mom, grandma, women+kids advocate, FLOTUS, Senator, SecState, hair icon, pantsuit aficionado, 2016 presidential candidate. Tweets from Hillary signed -H.
"Critics might say it's disingenuous or Machiavellian but I disagree," says Dagnes. "She's been in the public eye for 30 years, she knows if you don't define yourself, someone else will define you. "She's also trying to be more friendly, congenial - the criticism was she was too stiff in 2008. She poked fun at herself on Saturday Night Live. And we already know her, she's like Madonna, she doesn't need a last name." Democratic strategist Michael Bronstein thinks Hillary is wise to capitalise on her husband's name - which is one effect of dropping "Rodham". "Bill Clinton is probably the most popular living president. He's an asset. He's as American as apple pie," he says. "I think Hillary Clinton will want to further her connection." But Joanne Bamberger, author of Love her, Love her not: The Hillary Paradox, argues the name question is a "non-issue" and a "distraction". Lots of women keep their family name as their middle name but don't use it every day - and if Clinton is not using it now, she says, it may be simply because "Hillary Clinton" rolls off the tongue more easily than "Hillary Rodham Clinton". She doesn't think it will have any impact on how people vote. "People who love her don't care. People who hate her don't care. Her name is not going to swing voters - we know who she is," she says. If Hillary Clinton achieves her goal and becomes the US's first woman president, will she govern as Hillary Clinton, or as Hillary Rodham Clinton? Whatever happens, people are likely to remain curious about her name, says Kyle Kondik. "Hillary Clinton's last name has been something of a public question for about 35 years," he says, "and it will probably continue to be."